One of the major bonuses of Jo’ Burger (Rathmines) is that the entire menu is set up for customization. Although they do not claim anything to be ‘allergen free’ this is still an obvious benefit for anybody with food allergies because the staff are used to taking ‘with’ and ‘without’ customized orders. ‘Mix ‘n Match’ is the name of the game and even though I was going to limit myself to a snack of sweet potato chips/fries (which are très tasty!) Jo himself sat down beside us and went through what I could and couldn’t have on the menu which eased my weary mind and totally tempted my taste buds! I ended up with a lamb burger (no bun or wrap) with a very tasty (although I was initially doubtful) beetroot and horseradish relish on top with a side of mixed leaf salad with a lemon and oil dressing. The only ingredients to be aware of are the mayo. If you are dairy free and used to eating most mayo’s Jo’ Burger’s mayo is actually ‘mayo fraiche’ which is mayonnaise mixed with crème fraiche and therefore not dairy free. But this is not a major problem because there are sauces and relishes aplenty on all of the burger options. Also, do note that most of the sauces have some form of spicy chili, including the ketchup, so be sure to question your waiter if you have problems with chili or anything similar… This is why I chose the roasted beet and horseradish option but I very surprised with the great taste because I am traditionally a beetroot hater but this relish came up trumps! To top it all off, Jo’ Burger is a great little place with live DJ’s (which can get a wee bit loud later in the evening if you mind that sort of thing) and changing graffiti clad walls with games to play should you desire- although we are the only ones I have ever seen playing them :) … the games are possibly more suited to the quiet times in the day like lazy Sunday afternoons as there can sometimes be a line outside the door to get in! The truly great thing is that I didn’t feel like a contrary customer who was an annoyance to the staff… If anything I felt that they really wanted me to enjoy my meal. Definitely one of the happiest and relaxed days that I’ve had in a while! Despite Dublin with Food Allergies’ main focus there is, of course, WAY more to Ireland than Dublin and it's so important to get out and about!... and so, with this in mind, last weekend I found myself in Cork. I have been there a good few times since I moved to Ireland and every time I go I like it more and more. It is a compact city (123,000 population & 3,731 hectares) but it’s the 2nd largest in Ireland. At first glance Cork can feel as small as it looks on paper because it can be hard to get beyond the main shopping thoroughfare but with a little bit of an exploratory nature there is a full and vibrant city waiting to unfold. During my weekend visit I had the lucky privilege of staying with some friends who are knowledgeable long term residents of the city with a foodie flare and a thoughtful awareness of food intolerances. Although we only had a limited time we managed to hit two spots which had my taste buds thumping! OK, from what I can gather, Cork Coffee Roasters is the bee’s knees when it comes to coffee in Cork, if not all of Ireland – or so is the word on the street! They hand roast their own coffee using traditional methods and produce a variety of home blends. Their main deal is roasted, ground and blended coffee made to order for delivery. HOWEVER, for the purposes of Survival Guide I would like to talk about their funky little café on Bridge St. Coffee is coffee and there can be some pretty good coffee but in my opinion the thing that puts Cork Coffee Roasters on the map is the fact that they not only offer soya milk as an alternative to cow’s milk but they also offer Rice Milk! I have NEVER seen this in Ireland! I simply couldn’t believe my eyes. Soya Milk has become the major substitute for cow’s milk and although I am genuinely thrilled to see a boom in dairy free milk substitution in our cafes and restaurants, the killer is that a lot of people can’t handle soya so rice milk as another alternative shows signs of true flexibility and understanding in my opinion. It is my milk of choice and I seriously hope that this catches on! With a whole-food shop downstairs a vegetarian restaurant upstairs which also caters to food intolerances, AND an in-house bakery, the Quay Co-op have it covered. After my dairy free high in Cork Coffee Roasters I was really excited when my friends brought me to the Quay Co-op Vegetarian restaurant for dinner. Road trips can be hungry events and after having to limit myself to a banana and pistachio nuts on the four hour bus journey from Dublin to Cork I couldn’t wait to dig into something warm, hearty and food allergy friendly! Although the Co-op is set up in a canteen style the seating resembles a bright fresh café style restaurant with two floors of seating spread across three rooms. It’s similar to Dublin’s Cornucopia by way of the menu and service but an important element of the Quay Co-op is that it is a worker’s co-operative! Choices for food are between two soups, two daily specials, lasagna, pizza, burgers and tarts with a selection of salads and/or warm vegetables. In addition to this there is a selection of sweet cakes and beverages. I used to make these cookies just dairy free and always found it hard to refrain from eating the full dozen, but when my food allergy blood test came back with the list of foods to eliminate from my diet I thought my favourite cookies were going to be off limits entirely but after a little bit of thinking, reading and experimenting I made it happen… And yes, I'm still finding it hard to not eat the full dozen! Obviously if you don't have problems with eggs, wheat or gluten feel free to substitute all of the flours for just 150g (1¼ cup) white wheat flour and 1 egg for the flax and water mixture seeing as that is the original recipe but I think that you will find either variation acceptable. Sift the flours, soda and salt together. Blend or Cream margarine with sugars until ‘fluffy’. Add flax mixture and vanilla to margarine and sugar and beat together. Stir in dry ingredients. When fully blended stir in chocolate and nuts. Grease two cookie sheets with margarine. 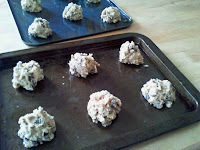 Roughly form six 2 inch balls of cookie dough onto each cookie sheet (totaling 12), leaving room for spreading. Bake in the preheated oven for 15 minutes or until the cookies retain some firmness when touched. Important: The cookies will be rather delicate when first taken out of the oven so let them cool on the cookie sheets for 5 or 6 minutes before transferring to a wire rack. Ideally use a flat metal spatula when removing cookies from the pan. also, thanks to the intolerant gourmet (see link under web excursions) for the egg replacement help! Fresh has been around longer than Blazing Salads (which is owned by a different branch of the Blazing Salads blood line) and yet I must admit that I have only been there twice! I think that it is because it is out of the way up in the rafters of the Powerscourt Townhouse. But truly that is a very poor excuse when food allergy eating is such a scarce commodity so get thee/me to Powerscourt! Fresh is set up very much like a canteen up on the top floor of the townhouse. There are two entrances – one is through the Italian balcony based restaurant and the second is at the back from the Clarendon St side of the building by the washrooms. The only way I can describe Fresh is as a bridge between Cornucopia (see my Aug 4th 2010 log) and Blazing Salads (see my Sept 11th 2011 log). There is a large chalk board upon entering (behind the counter) which lists all of the foods available and their allergy free attributes as well as a counter where you can view the salads and sweets. Possibly one of the more exciting elements of Fresh is their catering service available for large or small business functions or home based events which will ensure that all of your guests can fill up without leaving anyone out (A major benefit for those familiar with the plight of office functions for the food allergy worker!). So take a hike up to the third floor of the Powerscourt shopping centre and rejuvenate with a happy, healthy food allergy free lunch or bring it to the office if you know of an employee who is always bringing their own snacks along so as not to draw attention by going hungry during that lunch meeting! Valentine’s Day can be difficult for loved ones with food allergies or special dietary requirements. It’s the day when love is in the air and a lot of people want to bring their special someone out for a romantic meal but between allergies and commericialism it can end up being a bit of a mess. However, if you want to get his or her heart all a flutter by bringing them somewhere special and showing that you love and understand them AND their allergies take a trip to Wicklow this February 14th. But where there is raw there is usually understanding and a lack of many common food allergens but do be sure to ask details about then menu before booking. So if all of this sounds good call the number below to book your place and bring your valentine out for a romantic raw meal in Ireland's garden! This week I bring you another ‘Did You Know’ to help you find treats, snacks and/or healthy food-allergy friendly options when you’re roaming the streets of Dublin. It seems we went all green this week but the flavours are diverse, I assure you! As always I would like to stress the importance of reading the labels before you buy anything and the importance of studying them extra hard if your product has recently changed packaging because it’s usually a sign of ‘improved’ taste which means altered ingredient lists – the dread of food allergy diets everywhere! Carob is not chocolate. I think that the majority of people who hate carob are the people who eat it expecting chocolate. Although carob is often used as a chocolate substitute it really is a very different flavour which can be something of an acquired taste. Personally I love it and I especially love Siesta’s mint flavoured bar - yum yum yum! The biggest problem for me is that it contains soya and has a crazy fat content. Other than that the ingredients are so simple, there is no sugar and the taste is one to be craved once you get the hang of it ;) … Down to Earth, Nourish and the Hopsack are all stockists and a Carob Mint bar can be yours for about €1.50. There is also an ‘Original’ flavour and ‘Orange’ flavoured bar which always seems to be in stock but Mint has my heart. I have been a fan of this little bar for a number of years. It’s really affordable and tasty as could be. It resembles the consistency of nakd bars and fits in great for a quick snack. I have to limit myself when purchasing them though because I find them quite addictive and will eat as many as I buy all in one day! They are almost always available in Holland & Barrett. Yet another option on the snack bar circuit. Fruitus has a very simple ingredient list and doesn’t try to be too much other than an organic snack bar which doubles as one portion of your five-a-day. It reminds me of health food bars from my youth. Available in Holland & Barrett. There are four turnovers our in a package and if you are like me you will want all four to yourself! That’s not to say that they are small, it’s more of a representation of my own gluttonous behaviour. Anyway, these apple turnovers are a treat whether you have just one or all four. F says that they taste a bit artificial … and yes, I can taste what he’s talking about but then he has the option of picking up almost any fresh baked pastry with very few restrictions and Farmbake are not claiming to be pure and healthy. The real trouble is that they are made in a factory that processes milk protein/lactose, soya, egg and nuts so bear that in mind according to your own gambling nature. My rule is to generally stay away from ‘produced on a line’ products and proceed with caution when ‘made in a factory that processes’. If you do decide to give them a go they are available at many corner stores/newsagents for in or about €2.00 and I think that they are best eaten by first biting off the corners and then squishing the filling so it’s evenly disbursed! ;) -do check the best before date though and try to get the freshest batch. If you’re looking for an opposite to Farmbake’s Apple Turnovers then you might find it in Juice Master’s Veggie Juice in a Bar. This pure health bar is packed with vegetables, plants, algaes and friendly bacteria. I had seen it on the market a few times and had been a bit apprehensive… Frankly it sounded gross to me. The ingredients made me think that this bar couldn’t possibly be an enjoyable experience then when I opened the wrapper and saw the black/dark green coloured bar (just like powedered spirulina in water) my fears were intensified. When I took a bite my instant reaction was: yuck… but then I chewed… took another bite... chewed some more and before you know it I was thinking that Veggie Juice in a Bar is actually a decent tasting and very healthy sounding possibility for a breakfast on the run or a snack while hiking and it’s really not half bad considering all the goodness that is packed in! I say go for it. I haven’t tried the Fruit Juice in a Bar, which I’m sure sounds more appealing but don’t let appearances deceive you, some things just take a little getting used to. 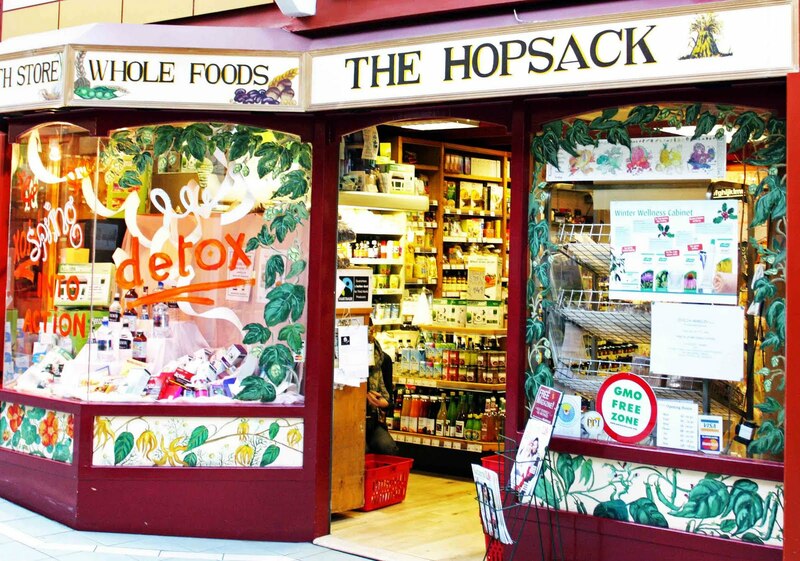 The Hopsack is a small and friendly family run health food shop based in Rathmines’ Swan Centre in Dublin 6. It was established in 1979 and has been going strong ever since. From the moment I moved to Dublin I have been frequenting the Hopsack (that’s almost 10 years! –which is a crazy thought in itself) and I have always been impressed with the staff's knowledge and their willingness to obtain any product that I’m looking for even if it is not part of their regular stock. In addition to their vast knowledge, the Hopsack's large team is extremely helpful and very generous with their time. Sometimes I wonder how they all fit in the small shop but don’t let the square footage fool you! Every inch is packed full with supplements, homeopathic remedies, tonics, natural beauty products, wholefoods, baby food, teas, spices–and of course that includes a whole rake of food allergy friendly products like ice creams, breads, cheeses, pastas, cereals, sweeteners, spreads, flours, snack bars and I know not what else! Something else unique to the Hopsack, which I find 'somewhat' rare with healthfood shops, is their active internet existence. www.hopsack.ie is a vibrant online site with local news, health tips and adventures. I definitely suggest logging on because there is an online shop, an active blog/news page, a handy link page for related resources and even a members forum (although it seems to be a bit quiet since mid 2009 but there is still some golden information stashed away in them there hills). 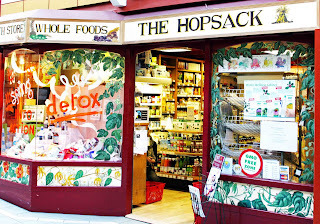 Every healthfood shop has its specialties and personal reasons for you to frequent but I can safely say that if you are seeking advice, guidance or clarification on your allergies/intolerances or indeed any health query then the Hopsack is one of your best options.